Chaplin was born in Bendigo, Victoria, in September 1984 with incomplete paraplegia. In 2010, she graduated from the University of Illinois at Urbana-Champaign with a Bachelor of Science degree while she started playing wheelchair basketball in 1999. She made her WNWBL debut in 2000 and achieved the ultimate success with the Rangers when they won the Championship in 2011 and 2012 while 2012 also saw her earn the 3.0 MVP and a position in the All-Star Five. Overseas, Chaplin played for the University of Illinois Wheelchair Basketball and was the team's starting point guard before being named All-American in 2006/07 while the following year, she won the national championship and was named the tournament's MVP. 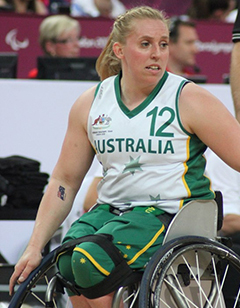 Chaplin was first selected for the Gliders in 2001, hitting the court in 2002 where they won bronze at the 2002 World Wheelchair Basketball Championship. She then helped the team win the Osaka Cup from 2008-10 and was named captain of the Gliders at the 2013 Osaka Cup where she was named MVP of the tournament. At the Paralympics, she is a three-time medalist having won silver in 2004 and 2012 as well as a bronze in 2008 before going on to compete for the Gliders at the 2018 World Championships in Hamburg, Germany.